During many industrial processes, a filtering step may be required to remove impurities and improve quality of the final product. Depending on the process, the filter may be subjected to high temperatures and a corrosive environment. A filter material with good temperature and chemical resistance is therefore needed. Ceramic filters meet these requirements and are finding use in a wide range of applications. One major application is filtration of molten metal during casting of various components. Another is diesel engine exhaust filters. The world market for molten metal filters exceeds $200 million per year. The metal casting industry is the sixth largest in North America, contributing over $20 billion to the U.S. economy. About 13 million tons of metal castings are shipped every year, with 85% made from ferrous (iron) metals. Castings are used in over 80% of all durable goods. In the casting process, a solid metal is melted, heated to proper temperature (and sometimes treated to modify its chemical composition), and is then poured into a cavity or mold, which contains it in the proper shape during solidification. Thus, in a single step, simple or complex shapes can be made from any metal that can be melted. Cast parts range in size from a fraction of an inch and a fraction of an ounce (such as the individual teeth on a zipper), to over 30 ft (9.14 m) and many tons (such as the huge propellers and stem frames of ocean liners). Though there are a number of different casting processes, die casting is used for over one-third of all metal castings and contributes over $7.3 billion to the U.S. economy every year. This process involves injecting molten metal into a steel die under high pressure. The metal—either aluminum, zinc, magnesium, and sometimes copper—is held under pressure until it solidifies into the desired shape. Parts range from automobile engine and transmission parts; to intricate components for computers and medical devices; or to simple desk staplers. The various casting processes differ primarily in the mold material (whether sand, metal, or other material) and the pouring method (gravity, vacuum, low pressure, or high pressure). All of the processes share the requirement that the materials solidify in a manner that would maximize the properties, while simultaneously preventing potential defects, such as shrinkage voids, gas porosity, and trapped inclusions. These inclusions can be removed by placing ceramic filters in the gating system leading to the mold. Such filters must resist attack at high temperature by a variety of molten metals. These metals can contain such reactive elements as aluminum, titanium, hafnium, and carbon. Using these filters can reduce scrap rates by 40% and increase yields by 10% for manufacturing a wide range of parts made out of iron alloys, stainless steel, super alloys, aluminum, or other nonferrous alloys. Molten metal filters generally come in two forms: a porous foam-like structure with interconnected pores that vary in direction or cross section, or an extruded porous cellular or honeycomb structure with cells of various shapes (square or triangular) and constant cross section. Though globally the most popular type of filter is foam, cellular filters are used in 75% of applications in North America. Filters can have either open cells or closed cells. Open cell (reticulate) filters consist of a network of interconnected voids surrounded by a web of ceramic and are widely used for molten metal filtration. Closed cell filters (foams) consist of a similar network but the beams are bridged by thin faces which isolate the individual cell. The open porosity in an open cell structure is critical in filter applications. The properties of a filter depend on both the cellular geometry (density, cell size) and the properties of the material. Advantages include high temperature stability and low weight. The pore size of these filters are defined as cells or pores per linear inch (ppi). For honeycomb filters, this ranges from 64-121 ppi or 240 ppi. For foam filters, pore size is much more difficult to measure but generally ranges from 10-30 ppi. Foam filters, which were first introduced over 20 years ago for nonferrous casting, are also used in direct pour units for casting steel. Inclusions that range from 0.125-2 in (0.3175-5.1 cm). or more in length and up to 0.25 in (0.635 cm) in depth can be removed. These inclusions come from molding materials, ladle refractories, and reoxidation during the pouring process. Filtration occurs by mechanical interference, with large inclusions separated at the filter face and smaller inclusions trapped within the filter. Foam filters are able to trap inclusions significantly smaller than their open pore areas and can also remove liquid inclusions. Thermal shock behavior (the resistance to sudden changes in temperature) for foam filters is dependent on their cell size, increasing with larger cells. Strength is initially retained after thermal shock and then gradually decreases with increasing quench temperature. A higher density may also improve thermal shock resistance. The filter material is usually a metal oxide powder of various compositions. These include aluminum oxide, zirconium oxide, spinel (a combination of magnesium and aluminum oxides), mullite (a combination of aluminum and silicon oxides), silicon carbide, and combinations thereof. Ceramic fibers of various compositions may also be added to improve certain properties. Other additives include binders (alumina hydrate, sodium silicate), antifoaming agents (silicone or alcohol), and other chemicals to improve slurry properties. Water is usually used to make the ceramic slurry. For optimal filter performance, a filter must be designed with the proper composition, pore size, and properties that match the specific application. Size and shape must be tailored to fit the mold system of the part being cast. Sufficient port area must be allowed so the filter does not choke the gating system during filtration. Filter area should be between three to five times the total choke area that the filter is feeding. The major performance criteria when designing a filter are flow rate, filtering efficiency, hot/cold strength, slag resistance, thermal shock resistance, quality level, and cost. Each design is better at some than others, with significant design tradeoffs required in many cases. Ceramic filters are manufactured in several different ways. 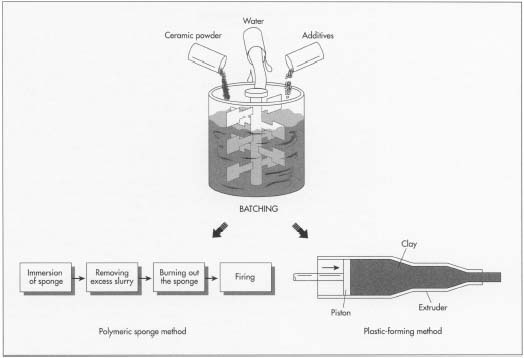 The polymeric-sponge method produces open-cell structures by impregnating a polymeric sponge with a ceramic slurry, which is then burned out to leave a porous ceramic. In order to create a honeycomb or cellular structure, a plastic-forming method called extrusion is used, where a mixture of ceramic powder plus additives is forced through a shaped die (like play dough). can also be produced using a pressing method. 1 First, a polymeric sponge must be selected with suitable properties. The pore size of the sponge determines the pore size of the final ceramic after firing. It must also be able to recover its original shape and convert into a gas at a temperature below that required to fire the ceramic. Polymers that can satisfy these requirements include polyurethane, cellulose, polyvinyl chloride, polystyrene, and latex. Typical polymeric sponges range in size from 3.94-39.4 in (10-100 cm) in width and 0.394-3.94 in (1-10 cm) in thickness. 2 After the sponge is selected, the slurry is made by mixing the ceramic powder and additives in water. The ceramic powder usually consists of particles less than 45 microns in size. The amount of water can range from 10-40% of the total slurry weight. 3 Before immersion, the sponge is usually compressed to remove air, sometimes using a mechanical plunger several times. Once it is immersed in the slurry, the sponge is allowed to expand and the slurry fills the open cells. The compression/expansion step may be repeated to achieve the desired density. 4 After infiltration, between 25-75% of the slurry must be removed from the sponge. This is done by compressing the sponge between wooden boards, centrifuging, or passing through preset rollers. The gap between rollers determines the amount removed. Sometimes the impregnated foam goes through another shaping step since it is still flexible. 5 The infiltrated sponge is then dried using one of several methods—air drying, oven drying, or microwave heating. Air drying takes from eight to 24 hours. Oven drying takes place between 212-1,292° F (100-700° C) and is completed in 15 minutes to six hours. 6 Another heating step is required to drive off the organics from the slurry and burn out the sponge. This takes place in air or inert atmosphere between 662-1,472° F (350-800° C) for 15 minutes to six hours at a slow and controlled heating rate to avoid blowing apart the ceramic structure. The temperature depends on the temperature at which the sponge material decomposes. 7 The ceramic structure must be heated to temperatures between 1,832-3,092° F (1,000-1,700° C) to densify the material at a controlled rate to avoid damage. The firing cycle depends on the specific ceramic composition and the desired final properties. For instance, an aluminum oxide material may require firing at 2,462° F (1,350° C) for five hours. Raw materials usually must meet requirements regarding composition, purity, particle size, and other properties. Properties monitored and controlled during manufacturing are usually dimensional and then design specific. For foam filters, the weight of the filter must be measured to determine coating efficiency. Extruded filters are measured for density. Both parameters relate to strength properties. The manufacturing process is carefully controlled to minimize waste. In general, excess slurry cannot be recycled since it could change the purity and solid loadings of the original slurry, thereby affecting final properties. The metal casting market is expected to decline by 2.7% in 1999, mainly because of the weakening global economy, with total shipments expected to reach 14.5 million tons. Sales will increase slightly to $28.8 billion. Though casting shipments will continue to decline slightly in 2000 and 2001, over the long term, shipments are expected to reach almost 18 million tons in 2008, with sales of $45 billion. Shipments and sales will see 10-year growth rates of 1.7% and 4.75%, respectively. The increased use of lighter-weight metal components, such as aluminum die castings, has spurred growth in the automotive sector. Today, there is an average of 150 lb (68.1kg) of aluminum castings per vehicle, an amount projected to grow to 200 lb (90.8 kg) per year by the year 2000. Ceramic filters will continue to play an important role in producing quality castings and will follow the growth of the casting market. Dollar volume may decrease due to continued price reductions. Quality and productivity demands for metal castings are increasing the need for filters since they provide a fast and reliable way to obtain good castings. Thus, casting buyers are specifying "filtered" more and more often. Ishizaki, Kozo et al., ed. Porous Materials, Ceramic Transactions. The American Ceramic Society, 1993. "Metal pouring/filtering." Foundry Management & Technology (January 1996): C2-C6. Outen, John. "Reduce defects with direct pour technology." Foundry Management & Technology (August 1996): 108-111. Saggio-Woyansky, J., C. Scott, and W. Minnear. "Processing of Porous Ceramics." American Ceramic Society Bulletin (November 1992): 1674-1682. American Foundryman's Society. 505 State Street Des Plaines, IL 60016-8399. (800) 537-4237. (847) 824-0181. Fax: (847) 824-7848. http://www.afsinc.org/ . Hamilton Porcelains Ltd. Hamilton Technical Ceramics. 25 Campbell Street, Box 594, Brantford, Ontario, Canada N3t 5N9. (519) 753-8454. Fax: (519) 753-5014. http://www.hamiltonporcelains.com/ . Kirgin, Kenneth. "1999 Contraction to cause demand to dip to 14.5 million tons." Modern Casting Online (January 1999). Http://www.moderncasting.com/archive/feature-026_01.html/ . North American Die Casting Association. 9701 West Higgins Road, Suite 880, Rosemont, Illinois 60018-4721. (847) 292-3600. Fax: 847-292-3620. twarog@diecasting.org. http://www.diecasting.org/ .